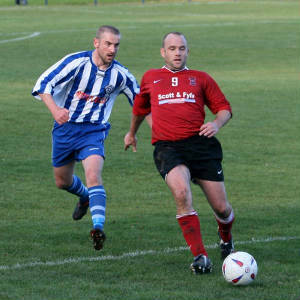 The game started at a frenetic pace and in the 4th minute a misunderstanding between Lynch and keeper Bald saw LYNCH head past his keeper to put Tayport ahead. 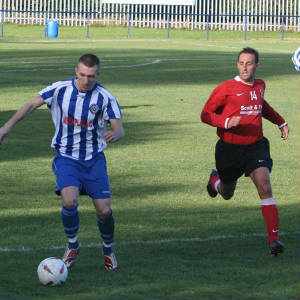 However, Penicuik picked up the pieces to put the pressure on Tayport and in the 15th minute a Coleman cross was well cut out by Fitzpatrick in goal. Five minutes later, Tayport’s Manzie crashed into the barriers under pressure from Steel, but after considerable treatment was able to continue. The next twenty minutes saw a midfield battle with neither side creating any chances. In the 37th minute, a slick one two between Coleman and Harvey saw Coleman get to the goal line. But his low cross was blocked and cleared. Three minutes later, a huge Fitzpatrick kick out was allowed to bounce by the Penicuik defence and again a misunderstanding between defender and keeper saw Gallagher’s pass back go past Bald, be he recovered to scramble back and clear. One minute into injury time, Moonie set up Harvey. He rounded keeper Fitzpatrick, lobbed the ball over the retreating defence, and with everyone expecting the ball to hit the back of the net, Black got back in time to coolly hook the ball off the goal line. Six minutes into the second half, Harvey and Coleman again combined well and Coleman crossed the ball into the box where there were loud claims for a hand ball, but referee Jamieson waved play on. Two minutes later a defence splitting pass picked out Moonie. He drove in on goal and appeared to be taken down by keeper Fitzpatrick, but again the referee waved play on. In the 56th minute, a great Lynch pass picked out Harvey who ghosted past Stewart, cut inside and let fly with his left foot, but his effort was inches off target with Fitzpatrick watching anxiously. Penicuik were piling on the pressure looking for the equaliser and only desperate defending denied Moonie and then Harvey. In the 66th minute, another excellent pass by Lynch was headed on by Harvey to Moonie. His header beat the keeper but came back off the bar and cleared. Five minutes later, Gay came close with a sizzling left foot strike that went just wide of the target. 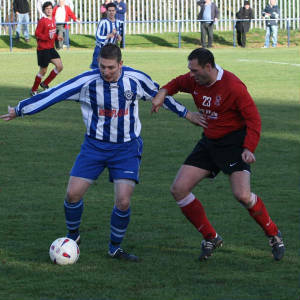 In Penicuik’s next attack Fitzpatrick comfortably saved Harvey’s shot. In the 84th minute with the pressure building, substitute Cole went up for a deflected shot with keeper Fitzpatrick but the referee adjudged him to have fouled the keeper. One minute into injury, following a Gay corner from the right, WALKER equalised when he headed home through a ruck of players on the goal line. Then one minute later, HARVEY rose above the defence to head home a Ryan Gay free kick and secure all three points for Penicuik.